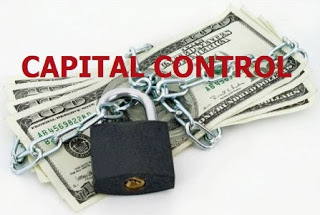 Capital controls are measures imposed by the government (via banks and financial institutions) to restrict the flow of capital. Restrictions can include taxes on financial transactions or regulations on the sale or purchase of equities and bonds. Sales of gold and silver can be restricted or prohibited. Capital controls can prevent or severely restrict cash withdrawals from banks (banks can be closed for extended periods of time for “bank holidays”). In 1933, President Franklin D. Roosevelt declared a “national emergency” and took total control over the gold owned by U.S. citizens (Executive Order #6102). The United States was not at war; however, President Roosevelt used World War I ‘war powers’ to close all U.S. banks and put an embargo on gold (“Trading with the Enemy Act,” March 6, 1933). On March 9, 1933, the “Emergency Banking Act” nationalized gold in America (and territories). Capital controls included the suspension of all banking activities, and the prohibition of gold sales and gold ownership (gold certificates, bullion, and U.S. gold coins). People were ordered to turn in their gold to Federal Reserve Banks, or face huge fines and 10 years in jail. The government paid $20.67/oz for the confiscated gold. Soon after, the price was manipulated to $35/oz. According to the Constitution of the United States: “No State shall… make any thing but gold and silver coin a tender in payment of debts….” [Article I, Section 10, 1789.] 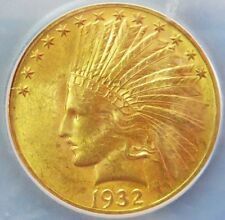 But after 1933, no U.S. gold coins were issued for monetary circulation. 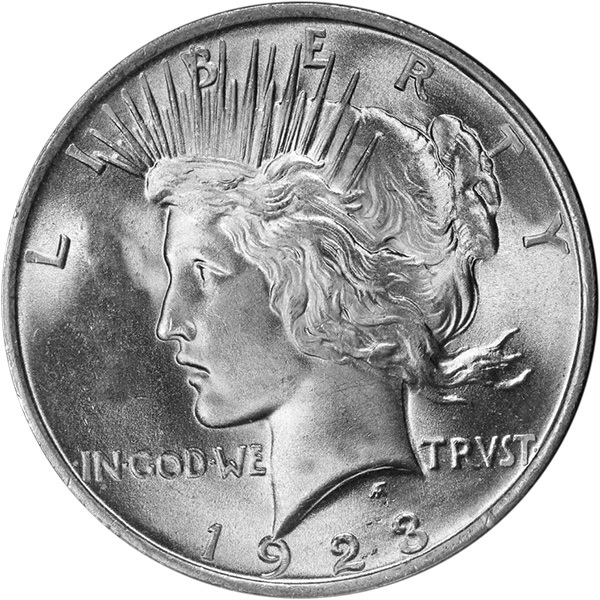 After 1934, the silver dollar (right) was no longer minted. In 1934, silver was nationalized. Why? To fill a MEGA supply-gap at the U.S. Mint. The government took control over privately-held silver bullion (people were paid 50.01¢ per oz), and control over silver from domestic mines (miners were paid 64½¢ per oz). Roosevelt’s EXECUTIVE ORDER #6814 threatened “Hoarders of Silver” with 10-year imprisonment and big fines. People who owned more than 500 oz of silver (80%+ pure) were ordered to turn in bullion to mints (August 9, 1934 to December 31, 1937). Although silver coinage was excluded from the confiscation, more than 122 million oz of silver were confiscated from individual Americans. In 1934, the U.S. needed 1½ billion ounces of silver for coinage. Shortages began in 1918 when the government melted down 270 million Morgan silver dollars (left) and shipped the bullion off to England. 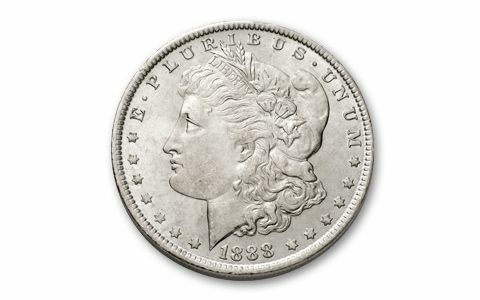 In 1921, the U.S. Mint recommenced minting silver dollars to replace the dollars that had been melted; but dimes, quarters, halves, and dollars were in short supply. From 1792 until the U.S. “bank holiday” in 1933, the HEAVY dollar was equivalent to 1/20th of 1 oz of gold ($20.67/oz). After the “Gold Reserve Act” (Jan. 30, 1934), the dollar fell 69% against gold. The LIGHT dollar was equivalent to 1/35th of 1 oz of gold ($35/oz). The day credit collapsed worldwide [Aug. 9, 2007], 1 FIAT dollar was equivalent to 1/662nd of 1 oz of gold ($662/oz London). On March 14, 2008, the dollar fell below 1/1,000th of 1 0z of gold for the first time. One dollar is now equivalent to 1/1,284th of a 1-oz gold coin (right). Since the U.S. bank holiday, the dollar has fallen 6,400% against gold. Today, a 1-oz gold coin costs 64 times as many dollars. The history of the dollar is a record of sudden changes in the value of the currency AGAINST GOLD — in 1792, 1864, 1913, 1934, 1971, 2008. Why gold? The great Wall Street banker, J.P. Morgan, explained to Congress that ALL monetary instruments derive their value (credit) from gold. Adolf Hitler (Germany) and Benito Mussolini (Italy) both outlawed individual ownership of gold. Both governments took total control of investments — including pensions. Citizens were forced to buy government bonds to finance the military and public-works projects. “[W]hen you recall that one of the first moves by Lenin, Mussolini and Hitler was to outlaw individual ownership of gold, you begin to sense that there may be some connection between money, redeemable in gold, and the rare prize known as human liberty….”* Hon. Howard Buffett, 1948. On August 15, 1971, President Nixon suspended the dollar convertibility into gold. From 1792 until the “NIXON SHOCK,” the dollar was 100% redeemable in gold in foreign exchange. Nixon’s decision to back the reserve-currency with nothing tangible ended the gold-based monetary system. For the first time in history, a “fiat-standard” was imposed on the entire world. India imposed harsh restrictions on gold purchases plus a 10% gold tax which forced gold smuggling. Spain, Poland, Argentina, and Ireland raided people’s private pensions. In Cyprus, large percentages of people’s deposits were used to bail out banks; Cypriots’ remaining balances were paid back in forms of bank shares. The State Bank of Vietnam banned gold bullion and gold material from entering or leaving the country [effective May 15, 2014]. Exchange controls are a sign of the times (see End Notes). It is now difficult for Americans to open foreign bank accounts; and U.S. laws are already in place to meet the next liquidity crisis [EXECUTIVE ORDER 12472, EXECUTIVE ORDER 13603, EXECUTIVE ORDER 11858, DODD-FRANK]. DEPOSITS AND RETIREMENT FUNDS ARE NOT SAFE. Financial markets are now integrated and inter-dependent. Loss of confidence in one major currency (such as the Euro €) could trigger implementation of controls on cash and investments (“gated trades”); expropriation via bail-outs or bail-ins; wealth taxes; border controls; local restrictions on silver and gold. The next time financial markets seize up, banks and ATMS could close or bank accounts could be frozen. At the first sign of big trouble, you could be locked in positions or locked out of positions. Capital controls could prevent the liquidation of Exchange Traded Funds (ETFs) and mutual funds, or prevent you from selling U.S. Treasury Bonds or bond-related funds. Now is the time to diversify with PHYSICAL gold and silver. Exchange PAPER currency for REAL money. SILVER & GOLD DOLLARS (below) will preserve your purchasing-power and provide you with ultimate liquidity. Take delivery of American Silver Eagles (new 1-oz silver dollars) and American Gold Eagles (new 1-oz gold $50). Oct. 16, 2013: JPMorganChase Business Banking halted the use of international wire transfers and limited cash activity in business accounts to only $50,000 per statement cycle (branches, night drops, ATMs). Oct. 18, 2013: The U.N. International Monetary Fund proposed a surprise, global wealth tax – a 10% tax on total household wealth, implemented before avoidance is possible. Dec. 22, 2013 (JPMorganChase): Spending caps were imposed on 10% of debit cards. Jan. 14, 2014: JPMorganChase changed cash deposit rules. Jan. 23, 2014: Harvard Professors Carmen Reinhart and Ken Rogoff called for capital controls similar to those in emerging markets. Jan. 24, 2014: HSBC restricted large cash withdrawals. Jan. 26, 2014 (Lloyd’s Banking Group): ATMs were stopped/ debit cards declined at major United Kingdom banks — Halifax, TSB, Lloyds. Jan.28, 2014: One of Russia’s biggest banks (Mohnbank) banned cash withdrawals. Feb. 2014: Federal Reserve Chairman Mrs. Yellen said the Federal Reserve is “exploring” negative interest rates for the U.S. (2/3 of central banks are already utilizing negative interest policy: people in the Euro Zone and Japan are charged a penalty on savings deposits). Feb. 12, 2014: The ECB Commission on Enforced Redistribution is “considering” expropriation of a portion of bank deposits to fund long-term investments and EU infrastructure projects. Feb.16, 2014: Italy imposed automatic 20% deductions on all inbound money transfers. March 2, 2014: Ukraine’s largest bank, PrivatBank, limited cash withdrawals to about $100 per day. March 3, 2014: Ukraine UniCredit Bank limited ATM cash withdrawals. April 2014: Bank Network Italy suspended all payments and announced a one-month bank holiday (authorized by the Bank of Italy). 2014 (Announcement by Finans Norge): Norway will be a cashless society by 2020. Nov. 16. 2016: Citibank is going cashless at some Australian branches. Nov. 2017: The Eurozone is “considering” imposing a 10% tax on all money deposited in European banks (per the advice of the U.N.’s International Monetary Fund). Aug. 15, 2018: Banks are curtailing “cash services;” but why? Why Are ATMs Disappearing at an Alarming Rate after a Wave of Branch Closures? by Don Quijones. 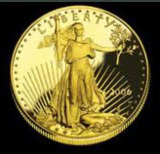 CONTENTS: Ancient Monetary System; CARAT Weights; KARAT Purity; TROY Weights; METRIC Weights; MILLESIMAL Fineness; FAR EAST Weights; British POUND (Pennyweight, Pound Sterling, Sovereign); DOLLAR (Old U.S. Gold Coins); Historical GOLD-to-SILVER RATIOS (U.S. 90% Silver Coins, American Gold & Silver Eagles); BIBLE Weights: TALENT, MANEH, SHEKEL, GERAH (Grain), BEKAH (Conversion Table); Semi-Rare & Bullion WORLD COINS (Gold Contents). One Response to WHAT ARE CAPITAL CONTROLS? Simple solution: Don’t vote Democrat.